There's something remarkably invigorating about buying something new. Wouldn't you say? As bloggers, we often receive products to review & try, but there's another level of satisfaction when you buy & choose an item yourself. It's carefully curated, hand-picked, & plucked from all the other products in the world. I've recently been on the hunt for more natural, cruelty-free options to add to my facial regimen. I try to avoid placing harsh nasties onto my skin whenever I can, but it's a work in progress. These are four items I purchased in the last couple weeks. I'm really excited about them! Oh me! Oh my! I can't contain my excitement; let's just get on with it. The very first thing I bought was the Palmer's Skin Success Eventone Facial Milk Foaming Cleanser. The long-winded name leaves me breathless if I try to say it in its entirety. Now try it three times fast. Never mind, you have better things to do. This foaming cleanser is not tested on animals. Woohoo! I don't really have much experience with foaming cleansers, but this Palmer's product sold me. It leaves my face squeaky clean & the scent is irresistible. I can't precisely place my finger on it, but it kind of reminds me of Jennifer Lopez's Glow by JLo perfume circa 1998. 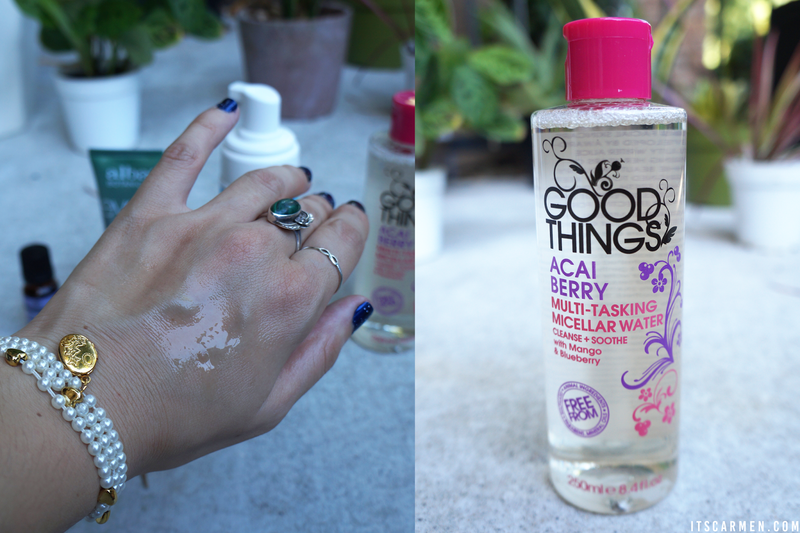 I have another long named product for you & it's the Good Things Acai Berry Multi-tasking Micellar Water Cleanse + Soothe. I purchased this micellar water at T.J. Maxx, but I did a little bit of online snooping & this brand is sold at Boots. I'd been hearing about the wonder of the world that is micellar water & I figured I'd give this brand a go. The slight berry scent is delightfully refreshing. I haven't used this too much, so stay tuned for an in-depth review in the future. 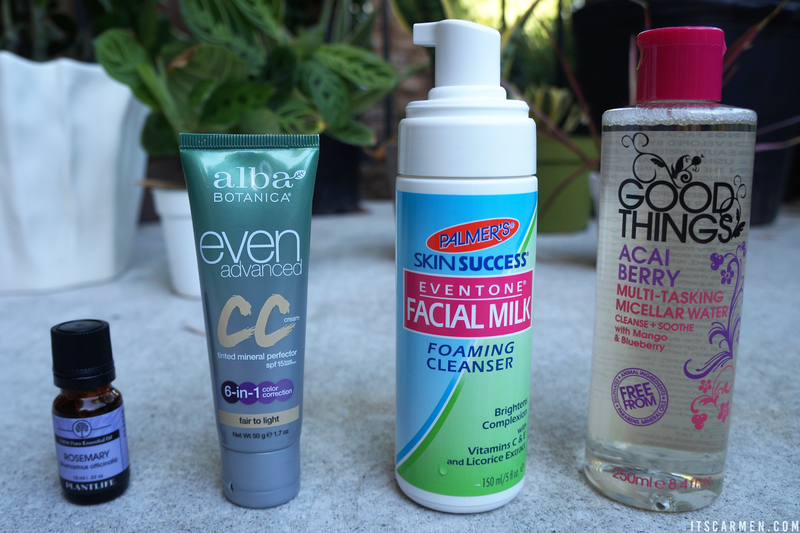 CC creams & BB creams are all the rage these days so I took note of it & made the leap. 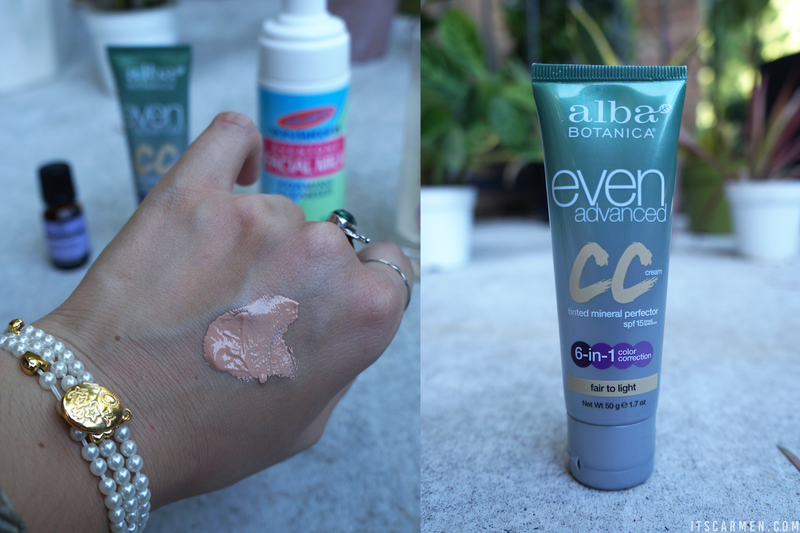 I decided to go with the Alba Botanica Even Advanced CC Cream in fair to light. The color actually looks pretty dark but it blends in effortlessly. I can immediately notice my skin has a more even tone once this is applied. Bonus points for SPF 15 & six-in-one color correction. I am an essential oil fan. I received some Aura Cacia essential oils last year & fell in love. Check out my review here. This Plantlife 100% Pure Rosemary Essential Oil is the newest to my collection. I adore the smell of rosemary; I enjoy adding it to my foods, but I never considered it as an essential oil. When I spotted this, I immediately purchased it. You can use essential oils for aromatherapy, massages, perfumes, baths, & more. I haven't used it except as a perfume & body oil so we shall see how it goes. I'll get around to doing a full review for each product in the next few weeks. I want to utilize them for a while before I give you an opinion. Make sure you stay tuned, friends. Meanwhile I will test these out & relish in the joy that comes with buying new products. Here's hoping I don't buy too much more. Eek. These sound like great products! Thanks for sharing! 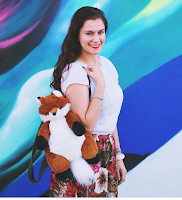 Such a great post, Carmen! I also try to avoid using products on both my hair and skin that have harsh ingredients. I try to look for sulfate and paraben free, not tested on animals and organic. I'm glad you feel the same, it's so important! I'll have to look into that Alba CC cream because as my skin is starting to clear up from some acne scars, I want to use something lighter on my face than a foundation and since you said you noticed it even your skin's tone, it sounds like a fit (I have some redness around my nose). My mom is huge into essential oils, so I've tried a few, but never rosemary! I'll have to look into that one. Thanks for sharing all this info and I hope you have an amazing day and weekend, beauty! The Acai Berry Water Cleanse sounds promising and I'm sure the subtle scent is incredible. Curious about your review, Carmen! Ooo, you have a good list here! 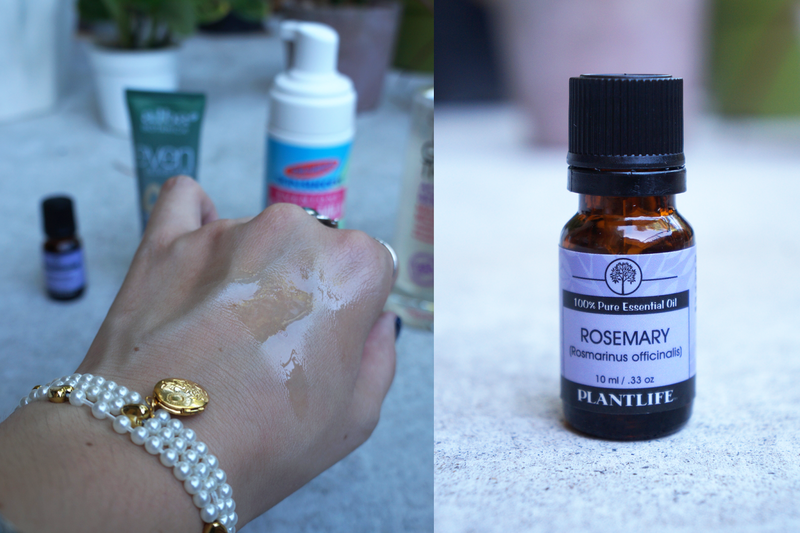 I have been enjoying Palmer's classing oil and it leaves my skin feeling really soft! Such an awesome post! I love learning about new products! The CC cream looks amazing, definitely something I would like to try! Very interesting post. I've never heard of these products before. I definitely get excited when buying new products for myself too :) I'm not a big oil fan but I've heard a lot about them so I might try some out! the micellar water sounds interesting! I'd love to try that foam cleanser. interesting products! looking forward to the individual reviews! I can't wait for your review of the micellar water. THat looks interesting, is it like a toner? Great selection of products! I can't wait to hear your review on the Good things Water Cleanse. And I love essential oils - my favorite is lavender oil. I also use peppermint and cedar wood for cleaning. I love your bracelet too - is that a locket? I really like Lavender oil. The smell is great and it helps soothing you. I've recently become addicted to having an essential oil bath... so soothing! Oh my gosh I have to try that face milk! You are right what a captivating name haha I am always a fan of more natural beauty products so this is a great round up for me!!! There is no other feeling in the world like buying new things.! 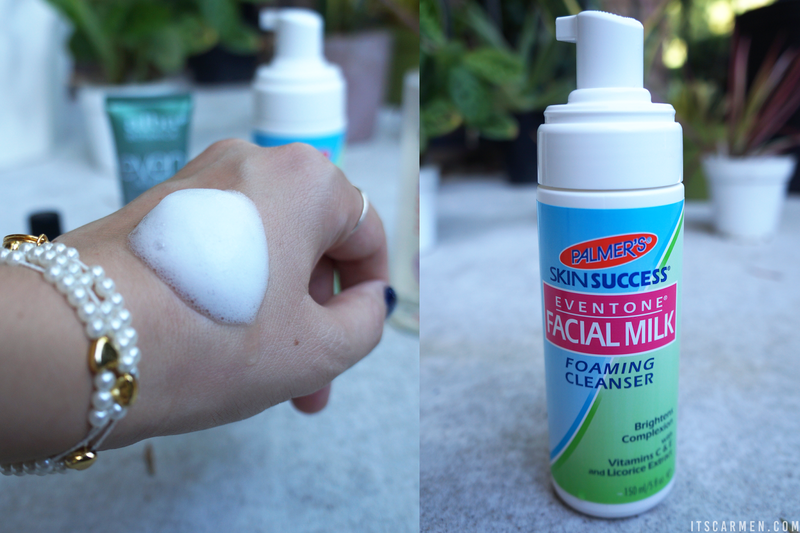 !I am really intrigued to try the Palmer's Skin Success Eventone Facial Milk Foaming Cleanser. What lovely treats for you to enjoy, so far they all sound fabulous. Sounds i great products to treat yourself with. Palmers products are really good.